Taking the bus can be a convenient and cost-effective way for getting around Oahu during your Hawaii vacation. The bus is the most frequent in Waikiki and Honolulu, and becomes less frequent the further away you get from these places. But, it can take you to most of Oahu! You may consider taking the bus to places that are further away from Waikiki and Honolulu like the North Shore or Kailua, but it does take more time requiring you to be patient! The Google Maps public transit feature makes it super simple to take the bus from Waikiki or Honolulu and get around Oahu, as well as to get bus directions on-the-go. No paper map with bus schedule necessary, just the Google Maps app on your phone! Using Google Maps, you can get a pretty good idea of how long it might take you to get from Point A to Point B by bus. The total time will include the time it takes to walk to the bus stop from your starting point, the time you will wait between transfers, the time it takes to walk from your final bus stop to your destination, and of course the time you can expect to spend on the bus. Estimated time and potential bus route revealed! Remember that there’s a chance you will encounter heavy traffic that will add on to your time, whether you’re driving a rental car or taking the bus! And while the timings on Google Maps is generally reliable, sometimes there are bus delays that might not be picked up too. If you are looking for directions at night when you’re at home, you may be given available bus routes at your local time, meaning a time that has fewer buses running. In this case, you’ll want to change the “leave now” to “depart at” a time in the morning or early afternoon to get a better idea of bus routes and transfers. Also, if you want to use the weekday bus schedule vs weekend bus schedule, you can do so too. If you’re planning to go somewhere on a Saturday or Sunday, it’s best to change the “leave now” departure for Saturday or Sunday. The bus on Oahu tends to be the least frequent on Sundays. Always make sure you are standing on the correct side of the road that will be taking you to your destination and not away from it! How much does the bus cost on Oahu? One trip on the bus costs $2.75 per person. You’ll want to make sure to have exact change, or at least dollar bills, as change is not given. If you’ll be taking the bus again to get back to your hotel or airbnb, you’ll want to ask the bus driver for a single day pass which is $5.50. Once again, be sure you have exact change or dollar bills. This will allow you to have unlimited trips on the bus for the rest of the day until 3am. You will simply present your bus pass to the next bus driver. The single day pass is new as of October 2017. Previously, transfer tickets were issued, but this is no more. Transfer tickets have been replaced by the single day bus pass. If you’ll be on Oahu for a couple of weeks and plan to explore a good part of Oahu by bus, you may consider getting a monthly bus pass. This costs $60, and that’s equivalent to around 22 single bus tickets, or 11 single day passes. The monthly bus pass is for the calendar month, so it will expire at the end of each month, no matter when you make the purchase. If you think you’ll be approaching 11 single day passes during your time on Oahu, it may be worth it to get the bus pass anyway for the convenience of not having to deal with carrying cash and exact change all the time. All you have to do is flash your monthly bus pass to the bus driver. There used to be a 4-day bus pass, but this is no more. So if you come across information about this, now you know. Don’t be too disappointed that you can’t get a 4-day pass anymore though. The cost of it ($35 – that’s 14 single tickets) probably wouldn’t help you save money unless you were taking the bus a ton. Check here to get the most updated information on bus ticket prices and bus passes. If you’re getting off at a popular bus stop when lots of people are on the bus, the bus will stop and the doors will probably open without you having to do anything. Pull the cord when your bus stop is next to notify the bus driver to stop at the next bus stop. This is where Google Maps can be really helpful so you can know when your bus stop is coming up. In order to exit the bus, when you are given the green light to do so (literally, there’s usually a green light), you touch the designated spot on the door so it will open. It’s really not as complicated as it may sound, and after you do it even just once, you will be a pro! It will make more sense once you’re on the bus and you see it for yourself. 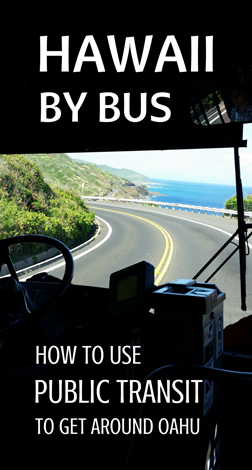 Just know the first time you take the bus on Oahu that you need to do these things! The estimated time, number of transfers, and public transit directions linked below are with a starting point of the Duke Kahanamoku Statue, which is in a relatively central part of Waikiki. If you know exactly where you’re staying, then plug that into the directions for the starting point so you can get a better idea of how many transfers and how much time getting to each of these locations will take by bus! Remember, in deciding whether or not you want to go somewhere by bus, you’ll also want to factor in the time you’ll spend waiting for the bus. This includes both getting there and getting back. You may want to consider how much walking is required too. For tips on getting to more places, see this map of Oahu by bus. Click on any bus icon, and in the description, there will be a link that takes you to information on getting there by bus. These types of maps are best explored from a desktop! If you’re coming to this page from Pinterest on mobile, first open up this page in your web browser, and then look at the map! 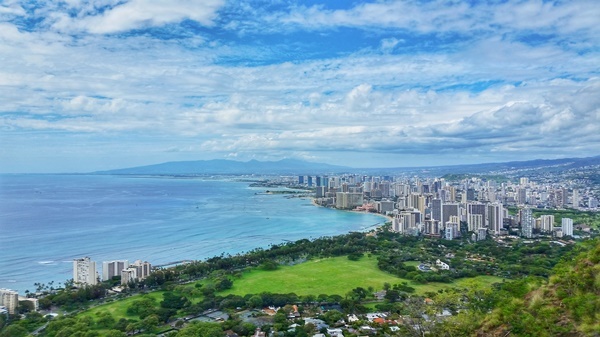 Depending on where in Waikiki you are staying, you may also consider getting in a little bit more activity by walking from Waikiki to Diamond Head! From the Duke Kahanamoku Statue, the walk to the trailhead is about an hour. And from there, you’ll start the hike on the Diamond Head Summit Trail. Remember, you can always take the bus on the way back to Waikiki! But, if the trail itself is enough walking for you, it’s easy to get from Diamond Head to Waikiki by bus. You’ll get off at the bus stop at the community college that’s right in front of Diamond Head. From there, you’ll walk a few minutes to get the Diamond Head sign, which signifies the road you want to walk down. From there, it’s a bit more walking to reach the official trailhead and visitor’s center, maybe 10 minutes or so. Waikiki to Hanauma Bay by bus is a popular route, so if you get on at a later bus stop in Waikiki, you may have to stand the whole time on the bus until you reach Hanauma Bay. How close the bus drops you off: Once you get off the bus, you are there! 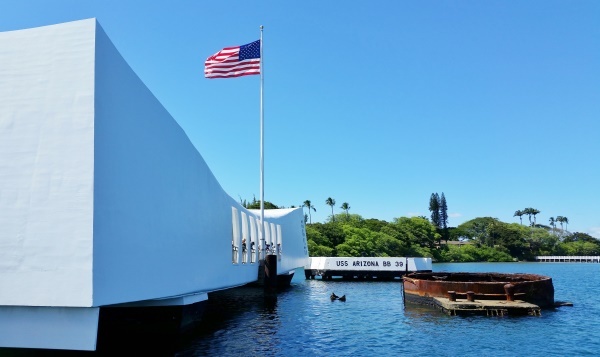 You’ll see a trip to the Pearl Harbor Memorial on a lot of lists of top 10 things to do in Oahu. If you’re American in particular, this is worth going to so you can get a better understanding of the history of Pearl Harbor and the tragic day in 1941. You can easily spend a full day here, if you want to. But you can also make it into a pretty quick trip too just to see the grounds of the Pearl Harbor Historic Sites. Although, if you’re making the trip out to Pearl Harbor by bus, it’ll probably be more worth it to spend several hours here. How close the bus drops you off: When you get off the bus, you are there! The bus stop to get off for the Koko Head Trail is just before Hanauma Bay. This means that you may have a crowded bus ride if Koko Head is your destination too. You can type in Koko Head into Google Maps, but it might give you directions to the Koko Head parking lot. The most convenient bus stop is called “Kalanianaole Hwy + Hanauma Bay Rd” so it’s better to type this in. 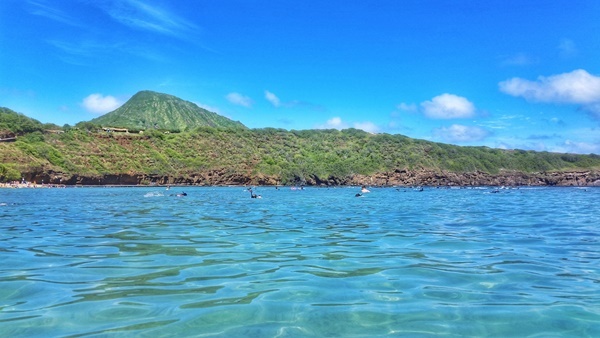 But of course, that’s not exactly easy to remember, so instead remember Hanauma Bay Nature Preserve, and then locate the bus stop on the map that’s located just before turning on to Hanauma Bay Road. Once you get off the bus stop, there will be a road that will take you to the base of the Koko Head crater. This road is technically not the start of the trail. 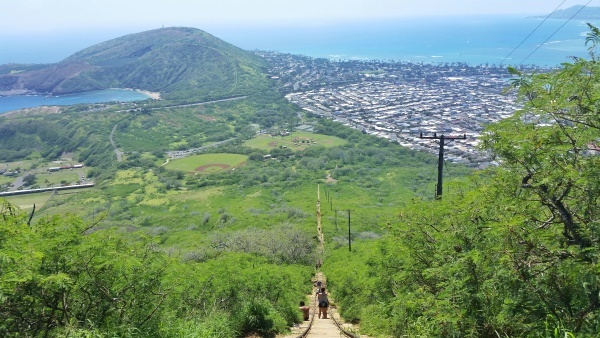 But because you will see Koko Head not so far away, it will make you feel like you are starting the hike pretty much as soon as you get off the bus! 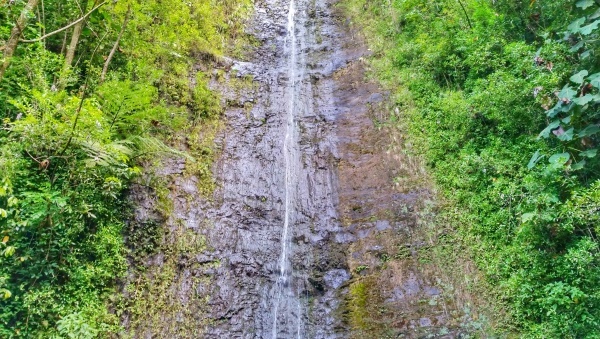 Manoa Falls is one of the most popular waterfalls in Oahu as a tourist attraction. Despite being pretty close to Honolulu, to reach the Manoa Falls Trail by bus will probably require a bus transfer coming from Waikiki. This is because the road to get to the trailhead is through a residential neighborhood. Generally speaking, residential areas will have less bus routes passing through them. Manoa is also home to the University of Hawaii’s primary campus. You’ll walk another 10 minutes or so up the road to get to the trailhead. You’ll pass by a shop, a parking lot for Manoa Falls (fee for parking), the Lyon Arboretum, and then you’ll get to the start of the Manoa Falls Trail. The shop is more like a little rest area with a convenience store and bathrooms, which you can use no problem. 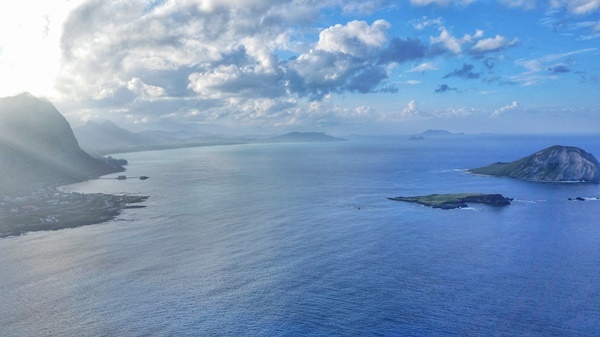 If you’ll be in Oahu during whale season, Makapuu Lighthouse Trail could be one of your best chances for seeing whales without going on a tour. But whale season or not, this is a paved coastal trail that offers you scenic ocean views much of the time you’re on the path. This isn’t the safest place to get to by bus. The walk from the Sea Life Park bus stop to the start of the trail doesn’t have sidewalks, so you’re walking on the shoulder of the road with cars zooming past you. It’s not that unsafe that it will stop you from going here by bus (unless you have small children maybe! ), but you’ll just want to be careful. How close the bus drops you off: From the bus stop at Sea Life Park, it’s about a 15 minute walk to get to the start of the trail. It will be a scenic walk to get to the trail too! This is a popular trail because of the view of the famous Mokulua Islands you get from hiking to the pillboxes. There’s no official landmark to plug into Google Maps for the start of the trail. So the best thing to do is to locate the start of the trail on the map, and then get directions. 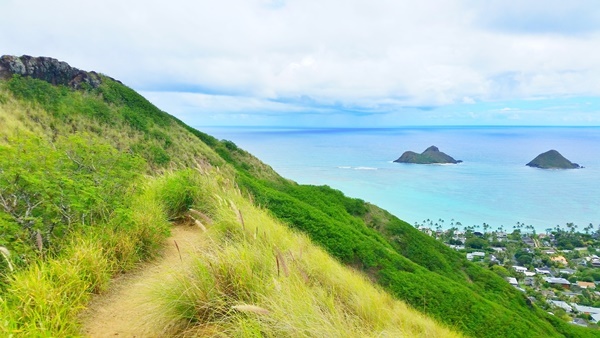 Doing this trail will put you right at Lanikai Beach, which has been named one of the best beaches in the world, so you’ll definitely want to head over there, whether it’s for a beach walk, or more! It’s not as convenient to get to Lanikai by bus as the other hiking trails and snorkeling spot mentioned so far, and it will also take more time. How close the bus drops you off: To do the full ridge trail, it’s about a 10 minute walk from the bus stop to the start of the trail. You will be walking through a residential neighborhood to get there. 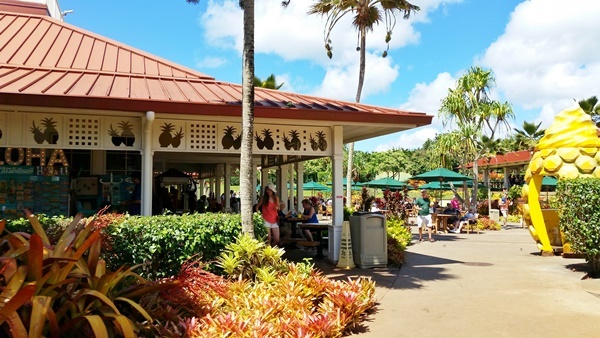 If you are ambitious (or rather, patient with your time on the bus and waiting for the bus), you can also head to the North Shore after your visit to the Dole Plantation. As long as you start your day early and don’t plan to spend all day at the Dole Plantation, it can be realistic. 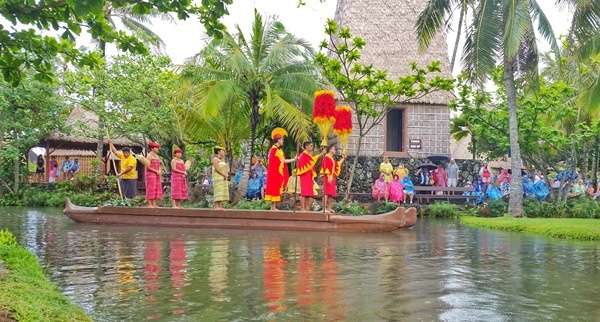 Taking a bus is definitely not one of the best ways to get to the Polynesian Cultural Center. But, if you are committed to taking the bus, it is possible to do so! How close the bus drops you off: There’s a bus stop right in front of the Polynesian Cultural Center.